Who Cares How Hilaria Baldwin Gave Birth? Having a baby is no joke. So why are we making a woman's body—in this case Hilaria Baldwin—and how she gave birth a topic of conversation? Here's why we should care. First, we judge women who gain more than the recommended amount when they're brewing a baby. Then, if they don't get their pre-baby body back right off the bat, we raise an eyebrow. And now, apparently, we want proof of how a woman delivered her child? 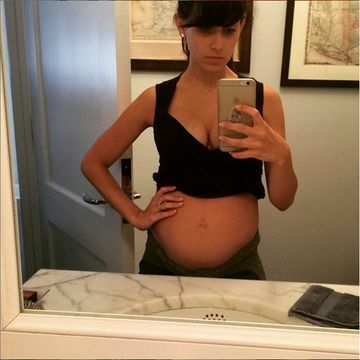 Hilaria Baldwin, wife of Alec Baldwin, and mom of two, took to Instagram to show how women's bodies look shortly after birth. It was a brave move that inspired us (much like Kate Middleton who greeted the public hours after welcoming Princess Charlotte into the world)—but as it goes, naysayers are always going to nay. Posing in her bra and undies, with a smaller, but noticeable baby bump, she wrote: "I have been planning on doing post belly photos but didn't know if I was gonna have the guts to actually follow through. I hope you understand my intention here: I believe it is important to accept and love our form after going through a bit of battle bringing life into this world. Deep breath, here we go...all the way from my glamorous hospital bathroom. #ShrinkingBaldwinBabyBump #NoShame #LoveYourBody"
In response, the internet started questioning if she had a cesarean and if she was okay, because she was still in the hospital. As a devoted yogi, Baldwin stayed active throughout both of her pregnancies, stretching and maintaining her practice up until her third trimester. She was also candid that she wanted a natural birth, but after these comments, she took to Instagram again to show a scar-free tummy. Though we commend Baldwin for standing up for women's changing bodies—especially after giving birth—we hate that she has to prove something. Her body is her body and how she chooses to share it or how she decides to have a baby ... is frankly no one's business but her own.